The new time show at 10:00 am in Beijing, China. When the prayer was still three hours away. A man seen near the mosque. The man hesitated for a moment standing in front of the mosque. There is a reluctance to set foot into the mosque, especially after seeing the writing on the gate of the mosque which was written in Chinese, English and Arabic reads "Just for the Muslims." But he brushed aside his doubts and ventures out into the mosque. "Can I help you?" suddenly a man greeted him, the mosque's imam. "I want to be a Muslim," said the man addressed. Imam mosque smiled and greeted the man who wants to enter Islam. She took him to the office of "The Muslim community" which is located near the mosque. The priest handed me three little books on Islam. She wanted him to learn more about Islam, the religion who want to cuddle. The young man turned out to not only read all these books, but read many other books about Islam. He also often took several imams in mosques to discuss to prove that he knew what he wanted to do. Finally, a priest led him to say two sentences young man's confession of faith and officially became a Muslim. The man is Jang, who after converting to Islam changed his name to Salim. After bersyahadat, Salim told why he wanted to become a Muslim. "It all started from the pork," Salim said, smiling. Islamic teachings to eat enough food, including a ban on eating pork, sparked curiosity Salim and encouraged him to find out more about Islam. "I'm researching medical journals and read many books to find the answer," Salim said. He found the answer why Islam forbids pork. Islam regards pigs as unclean animals or omnivores omnivorous. Pigs do not distinguish between meat or vegetation in eating habits. In contrast to cattle or sheep for example, that only eat plants. Some scientists also say that eating pork can cause at least 70 kinds of diseases in humans. "I found the same conclusion in the Chinese traditional medicine is not recommended to eat pork meat and call it a most unhealthy and dangerous," said Salim. Upon his experience, Jang interested in Islamic religion and decided to convert to Islam. He is now part of the Muslim community in China which, according to official data of more than 30 million people. Islam has penetrated the country of China through the merchants, in the era of the Tang Dynasty about 1300 years ago. In fact there are historical records that mention that the friends of the Prophet Muhammad never visited China. 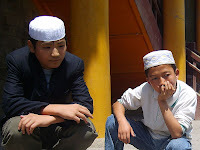 Although the Muslim community in China is large enough, they often become targets of oppression and discrimination of Chinese communist-oriented government. But who can stand in the light of Islam and the guidance that Allah gave to his people. Jang or Salim is one such example. He get's guidance with a unique background, simply because the issue of pork.